Could This Be The Cosmic Blink Anti-Trumpers Are Waiting For? 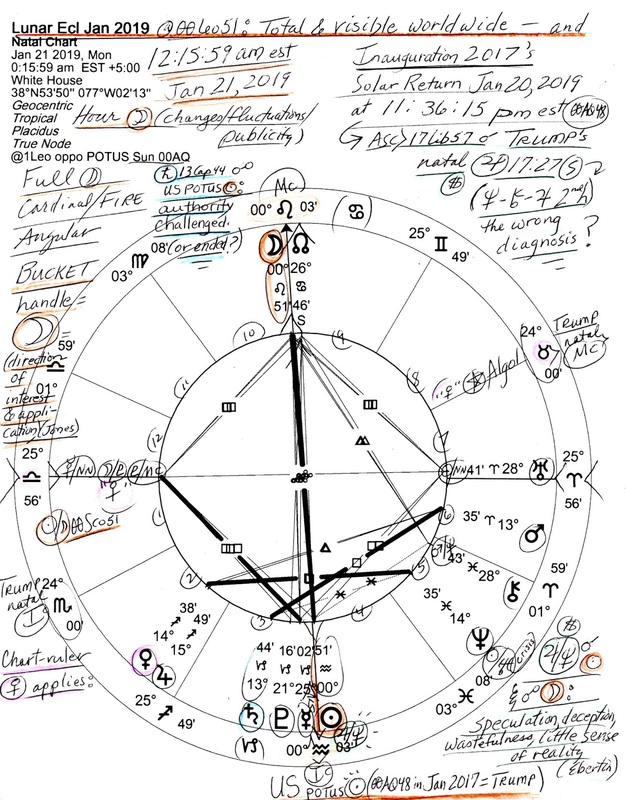 As you see in the above horoscope set for the White House on January 21, 2019, a Total Lunar Eclipse @00Leo51 will 'eclipse' our US POTUS Sun (Inaugural Sun @00AQ49 on January 20, 2017 = Trump playing president) and transit Saturn, legal eagle, time keeper, and karmic lesson-bringer, will oppose US natal Sun (13Cancer 19 on July 4, 1776) bringing restriction and possibly an ending to some if not all of Trump's Oval Office role playing as America's commander-in-chief, a job he was ill-prepared for but that was the point for those who placed him in that particular position. For all those who placed Trump in charge had to know of his unstable, substandard, know-nothing, compromised, corrupt condition beforehand but they socked it to America anyway. That he was highly suggestible and didn't ask any questions made him the malleable choice especially after being 'groomed' for years to play the role he'd always coveted anyway. Gemini the thespian! Now both solar eclipses affected--affect--him, yes, so the Lunar Eclipse shown above could very well be a third-times-the-charm direct hit to Donald Trump via his role-playing as POTUS or it could be simply a blow to the US presidency itself, its power and authority and not the ending of the amoral Mr. Trump as we've come to know and dislike him. 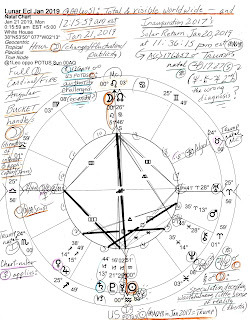 Note that the eclipse perfects only hours after Inauguration 2017's Solar Return 2019 occurs (exact on January 20, 2019 at 11:36:15 pm est with ASC 17Lib57 thus bringing up Trump's 2nd house Stationary Jupiter - exact to the degree and minute--17Leo27). If you wish, see my study notes penned on the chart upper right for a few more details. Glad to see you mention Big T looking directly at the elipse of his ultimate doom. The king's astrologers must have a cardiac when he did that! Anyway, i think he is always seeing a crescent burned on his retina!